This is what happens when foodies get together…. caramelized scallops with bittersweet grapefruit, peppery arugula in a shallot champagne vinaigrette. Have I enticed you yet? I spent the weekend with Kat of Food For Every Season and we created this fabulous salad after having a big brunch. I’m on a grapefruit kick lately and even if you’re not a huge fan I think you would really love the flavor combination you experience with each and every bite. This is the kind of salad you can easily see on the menu of a high end restaurant at a fraction of the cost; simple to make and elegant enough to impress guests. 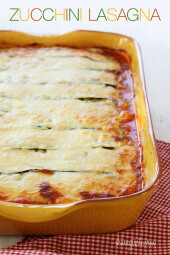 Great for lunch or a light dinner and ready in less than 20 minutes. This would also be wonderful with shrimp, enjoy!! Chop up remaining grapefruit for the salad. In a medium bowl whisk olive oil, squeezed grapefruit juice (from 3 slices of grapefruit), champagne vinegar, chopped shallots, salt and pepper. Heat a large pan on a high heat. When the pan is hot, add oil and place scallops in the pan. Sear without touching them for a few minutes until the bottom forms a nice caramel colored crust. Turn and cook about another minute while their centers are still slightly translucent (you can check this by viewing them from the side). Divide the baby greens evenly between four plates. 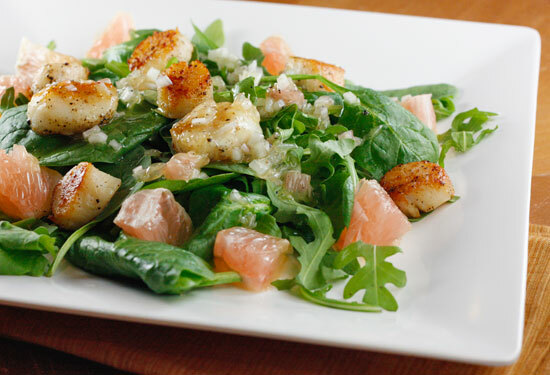 Arrange grapefruit on the plate and top with scallops; drizzle with vinaigrette. 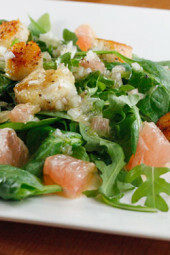 Gina, I love the idea of grapefruit in salads. This will gear up our taste buds for spring! Kelly, you can easily make this for one, just buy 1/4 lb of scallops. This is gorgeous! I will admit I don't make scallops at home nearly enough because usually whatever I make has to hold up for a few days of leftovers and scallops certainly do not. This would be gorgeous for a romantic dinner especially. once again this looks and sounds amazing! Kelci- you could use salmon instead! Shira- it's hard for me to control how people comment especially when they haven't made it yet. Glad you liked the clouds, hope u left a comment on them! I'm going to have to make this! It reminds me of a dish I had in Philly at a fancy French restaurant! A while ago, in reply to one of your recipes, one of the commenters mentioned that it is more useful when users comment AFTER they have made the dish, with comments on how it came out or suggestions on what they added/changed/substituted (e.g. if someone wants to make the dish low sodium, or if someone didn't have potatoes so used another ingredient instead). I agree with her. It would be more helpful than comments saying that it looks good. For users about to make the dish, such as myself, I find myself scrolling down through tons of comments to look for the useful ones. Maybe you could encourage readers to comment after they have made and eaten the dish. Just a suggestion, of course! This is not at all criticism of your work – which I appreciate hugely – but a constructive idea for your readers (which you could encourage them to do). As an aside, I made your black and white clouds (the meringues) and they came out great! Thanks! This looks fantastic! My fiancee is allergic to both scallops and shrimp- do you have another protein suggestion (could be fish) that would work well? Thanks! 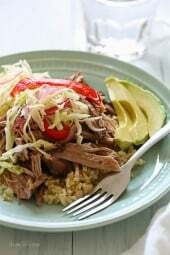 Gina, I love your site and the recipes are delicious. Thank you for your time. liren- i thought of you while peeling my grapefruit! jhobbs- You can use orange instead of grapefruit. kalyn, pretty hard to mess this one up will all these yummy ingredients! lko- i often wish the same thing! This looks amazing! A great change of pace as I start craving lighter summer dinners. I've never made a recipe of yours that we didn't love. Keep em coming! Why can't the food you make pop out of my screen? I love everything in this salad, looks great! 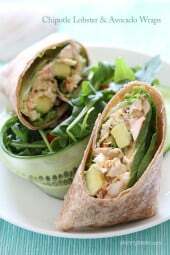 I just recently switched to a pescetarian diet and so have been looking for interesting seafood recipes and this one sounds delish! will def. try this one! thanks for sharing! Can't eat grapefruit due to a drug interaction. Any suitable substitutes? sounds yummy. looove anything with arugula! yom.